Joseph also described many other visions involving angels. Some of his earliest visitations involved a Native American prophet-warrior, who called himself Moroni. Smith said this angel appeared to him many times, the first in 1823, and showed him where to find a set of buried Golden Plates containing ancient writings that the prophet-warrior had sealed in a stone box before his death, together with other artifacts. The writings on the Golden Plates, according to Smith, contained an account of the various nations that inhabited ancient America, and described how they were led to the New World by Jesus, but eventually lost their Christian faith through a series of wars and corruption. After he said he received the Golden Plates 1827, Smith began to dictate what he said was their translation to his wife Emma Hale Smith and various of his associates, most notably Martin Harris and, for most of the later translation, Oliver Cowdery. Smith said he translated the text through the gift and power of God and through the aid of the Urim and Thummim. Smith described the Urim and Thummim "two transparent stones set in the rim of a silver bow fastened to a breast plate" (History of the Church 4:537). Harris and others at times referred to Smith translating the plates using a seer stone. 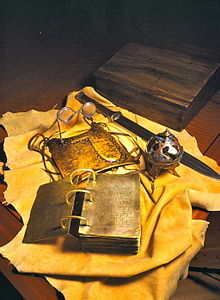 Initially, during the book's translation, Smith did not allow others to see the Golden Plates. Eventually, however, Three Witnesses wrote that they were shown the plates in June 1829 by an angel. (See Book of Mormon, preface) Another Eight Witnesses wrote that Joseph Smith, Jr. showed them the plates himself (Id.) The resulting writings were published in March 1830 as the Book of Mormon. The Book of Mormon was much more ambitious than being just a purported history of Native Americans. Mormons quickly adopted the book as a work of scripture of similar importance to the Bible. The book's title page described it as an attempt to show Native Americans "what great things the Lord has done for their fathers", and to convince "Jew and Gentile that Jesus is the Christ, the Eternal God." (Book of Mormon, title page.) The book contained doctrinal discussions on numerous themes, including how the pride of the wealthy leads to the downfall of civilization, the dangers of "secret combinations" of people who meet secretly and use secret signs and oaths, God's mercy and protection over his followers, and the meaning of the death and resurrection of Jesus. Some of the early movement's most important charismatic experiences were shared with Oliver Cowdery, who joined the movement during the translation of the Book of Mormon. Not only was he one of theThree Witnesses of the Golden Plates, he had also attempted to translate part of those plates, presumably using Smith's Urim and Thummim. However, his attempt to translate was unsuccessful. (LDS D&C 9:1). During the translation of the Golden Plates, Smith and Cowdery determined that they needed to obtain the Priesthood, which they believed had been lost from the earth during the Great Apostasy. Therefore, according to an account by Cowdery in 1834, they went together into the woods near Harmony, Pennsylvania on May 15, 1829, were visited by an angel who gave them the "Holy Priesthood". (Messenger and Advocate, 1(1), Oct. 1, 1834.) In 1835, Smith and Cowdery would clarify that the angel was John the Baptist, and that the "Holy Priestood" was actually, specifically, the Priesthood of Aaron". 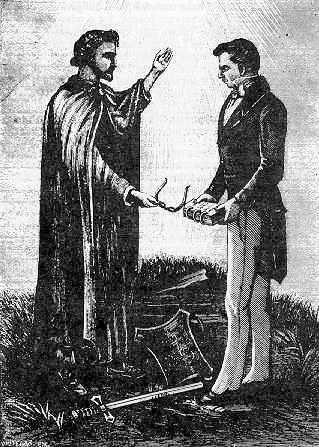 According to revisions in previous revelations added by Smith and Cowdery for the 1835 publication of the Doctrine and Covenants, the two men were also visited by Peter, James, and John, who restored to them the "keys of your ministry" and the "keys of the kingdom". Neither Smith nor Cowdery ever gave a date for this purported visitation. While official denomination histories favor an early date in 1829, many commentators think it might have been much later. There is no known record of an early Mormon concept of the Lord's church prior to Smith's translation of the Book of Mormon from April to June of 1829. During the course of this translation, the outlines gradually became apparent for a community of believers, with authority from God, ordinances such as baptism, and ordained clergy. Some time in April 1829, Smith dictated a story of Alma the Elder, the former priest of a wicked king, who baptized himself and his followers by immersion, "having authority from the Almighty God", and called his community of believers the "church of God, or the church of Christ". (Mosiah 18:13-17). The book described the clergy in Alma's church as consisting of priests, who were unpaid and were to "preach nothing save it were repentance and faith in the Lord". (Mosiah 18:20). Alma later established many churches, which were considered "one church" because "there was nothing preached in all the churches except it were repentance and faith in God." (Mosiah 25:22). In addition to priests, the book mentions that the clergy of these churches also included teachers. (Mosiah 25:21). Later, the book mentioned that the churches had elders. (Alma 4:7). Nevertheless, in May 1829, a revelation by Smith described the "church" in informal terms: "Behold, this is my doctrine: whosoever repenteth and cometh unto me, the same is my church: whosoever declareth more or less than this, the same is not of me, but is against me: therefore, he is not of my church." (Book of Commandments 9:16). Smith's further dictation of the Book of Mormon also stated that Nephi saw a vision of the Gentile nations and was told "there are save two churches only; the one is the church of the Lamb of God, and the other is the church of the devil", the "mother of abominations" which "had dominion over all the earth, among all nations, kindreds, tongues, and people." (1 Nephi 14:100). As a response to the book's ideas about baptism and the organization of churches, Joseph Smith, Jr. Oliver Cowdery baptized each other by immersion in May 1829 after purportedly receiving the authority to do so from an angel, John the Baptist. (See D & C 13). They also began baptizing dozens of people, as early as June 1829. (History of the Church 1:6, p. 59). These converts, however, did not belong to an actual formal church organization. Nevertheless, this community of believers referred to themselves as "the Church of Christ", and included converts in three New York towns: Fayette, Manchester, and Colesville. Some time between June and December of 1829,Joseph Smith David Whitmer and Oliver Cowdery said they received a revelation about "how he should build up his church & the manner thereof". This revelation was called the "Articles of the Church of Christ", and it indicated that the church should ordain priests and teachers "according to the gifts & callings of God unto men". The church was to meet regularly to partake of bread and wine. Cowdery was described as "an Apostle of Jesus Christ". According to David Whitmer, by April 1830, this informal "Church of Christ" had about six elders and 70 members. (Whitmer, Address to All Believers, 1887, p. 33). On April 6, 1830, Joseph Smith, Jr. Oliver Cowdery, and a group of approximately 30 believers met to formally organize the Church of Christ into a legal institution. Traditionally, this is said to have occurred at the home of Peter Whitmer, Sr. in Fayette, New York, but early accounts place it in Manchester. Soon after this formal organization, small branches were formally established in Fayette, Manchester, and Colesville. By later accounts, the April 6 organizational meeting was a charismatic event, in which members of the congregation had visions, prophesied, spoke in tongues, ecstatically shouted praises to the Lord, and fainted. (Joseph Smith History, 1839 draft). Also, the church formally ordained a lay ministry, with the priesthood offices of deacon, teacher, priest, and elder. Smith and Cowdery, according to their 1831 account, were each ordained as "an apostle of Jesus Christ, an elder of the church". ("Articles and Covenants of the Church of Christ", Painesville Telegraph, April 19, 1831). This account was edited in 1835 to state that Smith was ordained the "First Elder", and Oliver Cowdery was ordained the "Second Elder." (LDS D&CC 20:2-3). The movement more than doubled in size with the conversion of Sidney Rigdon, a former Campbellite minister. Rigdon led several congregations of Restorationists in Ohio's Western Reserve area, and hundreds of his adherents followed him into Mormonism. A fiery orator, Rigdon was called to be Smith's spokesman and immediately became one of the movement's leaders. By 1831, the church's headquarters were established in Kirtland, Ohio and Smith urged the membership to gather there or to a second outpost of the church in Missouri (see below). While based in Kirtland, the church changed its name to the "Church of the Latter Day Saints", and added a number of new doctrines and leadership offices. An attempt to establish a communitarian economy known as the "Law of Consecration" was established and abandoned in favor of a lesser law, soon after they proved themselves unready for greater laws. The Latter Day Saint understanding of the priesthood was elaborated by the separation of the higher or Melchizedek Priesthood offices from the lesser or Aaronic Priesthood offices and by the restoration of the Patriarchal Priesthood. Also established were the First Presidency, the High Council � later elaborated as the High Council of Zion, the Travelling High Council (or Quorum of the Twelvee) and Stake high councils � Seventies, patriarchs, high priests, and bishops. Kirtland also was the site of the construction of the movement's first temple. Latter Day Saints reported a great outpouring of spiritual experiences in connection with the Kirtland Temple's dedication. The temple was associated with the Kirtland-era "endowment", and with the ordinances of "foot washing", and "speaking in tongues." The movement also established the "School of the Prophets" which met in the temple. At Kirtland, Smith reported many revelations including the "Word of Wisdom" � advocating temperance and dietary restrictions. He acquired Egyptian papyrus scrolls which he said contained the writings of the Biblical patriarchs Abraham and Joseph. By many reports, it was in Kirtland that Smith first began to practice the doctrine of plural marriage. In 1837, the movement in Kirtland began to unravel because of apostasy within its ranks. Smith and Rigdon founded an "anti-bank" called the Kirtland Safety Society. When it failed because of speculative practices of some of the members combined with general bank failures in Ohio and elsewhere during the years 1837-1838, some 300 of the Kirtland membership became disillusioned, including a third of the church leadershipHeber C. Kimball recalled that "not twenty persons on earth" remained faithful to Smith. The result was the movement's first major schism. A new organization led by Smith's former secretary, Warren Parish, along with Martin Harris and others, vied for control of the church in Kirtland. Re-establishing the original "Church of Christ" name, these "reformed Latter Day Saints" took possession of the temple and excommunicated Smith and Rigdon. Smith and Rigdon relocated to Missouri and were followed there by hundreds of loyalists in a trek known as the "Kirtland Camp."